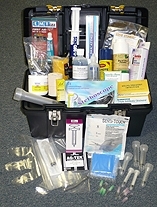 Our Medical Emergency kit includes helpful items to have for medical emergencies. All packed in a sturdy, hardshell, easy-to-identify case. All of these items have been tried and tested and we have used them here on our farm over the years. Nobody ever wans t to have an emergency on their farm, but if an emergency occurs, it is so helpful to have the items you need, right when you need them. The retail value of these items if bought separately, would be $250.00! One 20cc Luer Tip Syringe. THIS ITEM IS AN OVERSIZED ITEM AND SHIPPING WILL BE CALCULATED BASED ON DIMENSIONAL WEIGHT. THE WEBSITE MAY NOT BE ABLE TO ACCURATELY CALCULATE THE CORRECT SHIPPING CHARGES. IN THE EVENT THE SHIPPING CHARGES SHOWN ON YOUR INVOICE ARE NOT CORRECT, WE WILL CONTACT YOU WITH THE ACTUAL SHIPPING CHARGES FOR YOUR APPROVAL PRIOR TO SHIPPING THE ITEM. PLEASE EMAIL OR CALL US IF YOU HAVE ANY QUESTIONS ABOUT THE SHIPPING COSTS FOR THIS ITEM.